Click here to return to the main site. 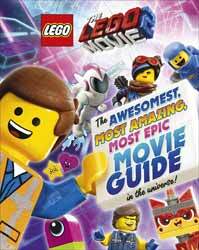 The LEGO Movie 2: Movie Guide is a cheap and very cheerful hardback reference book for the new LEGO movie. As you'd expect, it's packed with information and fun facts. It's aimed at young readers and so this could be the perfect way to get your little ones into reading. It takes you through The LEGO Movie 2's universe, laying out its characters and vehicles. The book's layout is full of large, colourful photos which makes it pleasing on the eye. And it's a release you can either read from page to page, or dip in and out of. If you're looking for a serious, behind the scenes look at the design of the characters or the animation process, then this is not for you... A little lightweight for adults, but perfect for the younger reader. Each of the store links below opens in a new window, allowing you to compare the price of this product from various online stores.